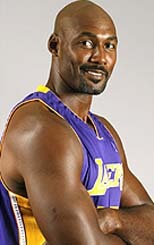 Malone played for the Utah Jazz and the Los Angeles Lakers, becoming the second-highest scorer in NBA history, above Wilt Chamberlain and below Kareem Abdul-Jabbar. He was a member of the 1992 and 1996 Olympic dream teams, and appeared 11 times on the NBA All Star team. Played 980 games in his career (only missing four from illness), scoring in one case an astonishing 61 points, in 1990 against the Bucks. Born in Ruston but grew up in Summerfield (where most think he was born).